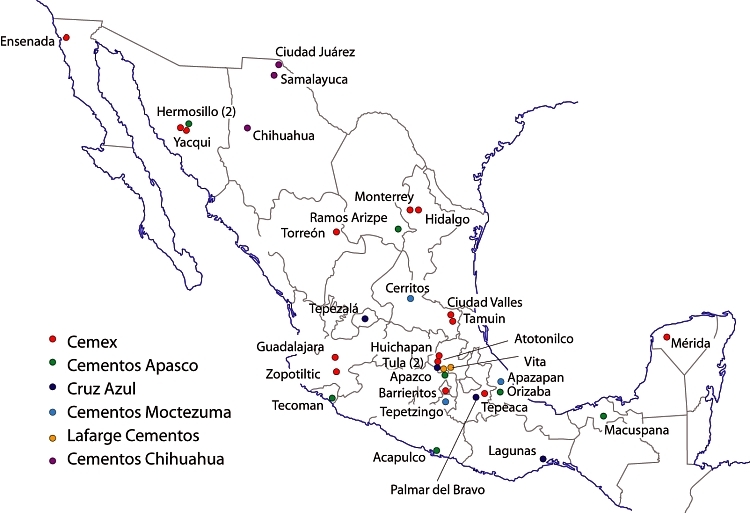 The map shows the location of the 34 cement plants currently operating in Mexico. They include 15 belonging to Cemex, 7 to Holcim Apasco, 4 to Cruz Azul, 3 to Cementos Chihuahua, 3 to Cementos Moctezuma and 2 to Lafarge. A new company, Cementos Fortaleza (part-owned by Carlos Slim, the world’s richest man), is due to open in the state of Hidalgo early next year. Cement plants in Mexico, 2011. Credit: Tony Burton / Geo-Mexico; all rights reserved. Click to enlarge. The paucity of cement plants in southern Mexico is particularly well reflected by the map. The main raw material for cement is limestone. 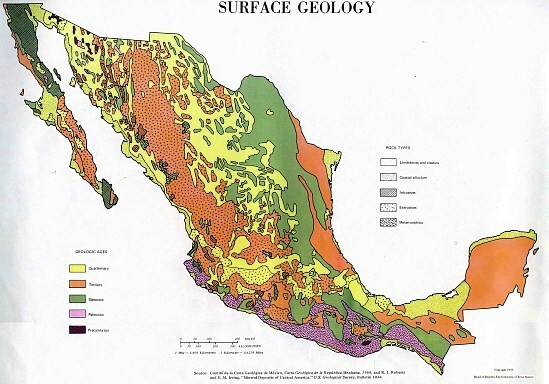 The distribution of cement plants in Mexico tends to follow the distribution of “limestones and clastic rocks” (rocks made of particles of other rocks) on the map of Mexico’s surface geology. Mexico’s surface geology. Click map to enlarge.